The planning of the construction of this sixth university began in August 1983 when the Ministry of Education Malaysia began to give form, in earnest, to the idea of setting up this university. On 19th October 1983, the Cabinet gave its official approval for this project in Kedah. At that time, the project was called “The Sixth University Project”. Several months later, the temporary office of the sixth university, officially named Universiti Utara Malaysia (UUM), was officially opened on 15th February 1984 in Jitra. Four months after its official opening, the UUM office was relocated to its provisional campus – the Darul Aman Campus – in Jitra, in June 1984, when the first phase of the project had been completed. The relocation was carried out so as to be able to usher in the very first batch of students for the academic year which commenced in early June 1984. The Darul Aman Campus was on a 62-acre tract of land in Bandar Darulaman. It was 18 km north of Alor Setar and 4.8 km from Jitra. In the meanwhile, the planning of a permanent campus for the university had already begun. 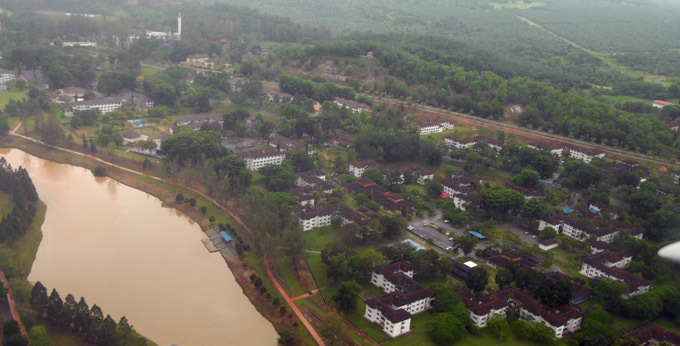 This permanent campus was to be built on an area of 1,061 hectares in Sintok (in the district of Kubang Pasu), situated about 48 km north of Alor Setar and 10 km east of Changlun, a small town along the North-South Highway, near the Malaysia-Thai border. The permanent UUM campus, referred to as the Sintok Campus, commenced operations on 15 September 1990. Situated in a former tin mining area, it is ensconced in a valley of lush tropical forests, embraced by blue hills, and watered by two rivers that flow along the middle of the campus. The rivers, Sungai Sintok and Sungai Badak, complete the scenic beauty of the natural environment, affording myriad vistas of verdant splendour. The MYR580 million Sintok Campus was officially opened on 17 February 2004 by the Royal Chancellor, His Royal Highness Sultan Abdul Halim Mu’adzam Shah. The main buildings of the campus are the Sultanah Bahiyah Library, the Chancellery, the Sultan Badlishah Mosque, the Mu’adzam Shah Hall, the Tan Sri Othman Hall, the Sports Complex, the Varsity Mall, the Budi Siswa building, the Convention Complex, and the buildings that house the various departments of the Academic Colleges. As a campus situated far from the madding crowd, UUM has ensured that its students do not want for adequate accommodation. At present, UUM has 15 Student Residential Halls (SRH), which, all together, house 20,000 students. The SRHs are named after Malaysian companies, institutions, and organisations of repute, namely MAS, TENAGA NASIONAL, TRADEWINDS, PETRONAS, EON, MISC, SIME DARBY, BSN, TM, PROTON, MAYBANK, YAYASAN ALBUKHARY, BANK MUAMALAT, BANK RAKYAT, and SME BANK. Apart from these, UUM also has comfortable accommodation available for visitors at the University Inn and the EDC-UUM Hotel. Mindful of the welfare and need for accommodation among its personnel, the University has built about 600 housing units of various types for a sizeable portion of its workforce. In January 2008, a restructuring of the university academic system was undertaken with the express purpose of preparing a strong structure that would enable the increase in the number of postgraduate students and the hoisting of the UUM flag in the international academic arena. The university sees the need to be global in practice and content since the knowledge it generates and purveys transcends and extends far beyond the borders of Malaysia. In this restructuring exercise, 13 faculties were merged and streamed into 3 main Academic Colleges, namely UUM COB (UUM College of Business), UUM CAS (UUM College of Arts and Sciences), and UUM COLGIS (UUM College of Law, Government and International Studies). This step is in line with the imperative articulated in the statements of both the Prime Minister and the Minister of Higher Education that underscored the need to increase the number of postgraduate students in the country to 100,000 by 2010. This main strategy is embedded in The National Higher Education Strategic Plan 2007-2010. To emblazon the name of UUM in the annals of academic excellence as an Eminent Management University and as a Research University in the Social Sciences, a UUM Transformation Plan was launched by the Vice-Chancellor of UUM, Professor Dato’ Dr. Mohamed Mustafa Ishak, in conjunction with his 2011 New Year’s Message on 1st January 2011 at the Mua’adzam Shah Hall. The Master in Islamic Finance and Banking program is designed to produce highly ethical and knowledgeable graduates in Islamic finance and banking who can contribute to the industry and society. The program is a 42-credit-hour program, consisting of 30-credit-hours of coursework and 12-credit-hours of a research paper. Students are required to take 8 core courses and 2 electives before they are allowed to write their dissertation. In which they are expected to demonstrate their ability in applying the knowledge gained as well as to enhance their writing and other soft skills. The aim of this program is to produce graduates with the advance knowledge, professional and analytical skills, and prepare them for the challenges of managing the organization in the current global environment. The program is a 40-credit-hour program, consisting of 32-credit-hours of coursework and 8-credit-hours of project paper. Students are required to take 7 core courses before they are allowed to write their project paper. In which they are expected to demonstrate their ability in applying the knowledge gained as well as to enhance their writing and other soft skills. The Master of Science (Decision Science) program is designed to promote professional development of researchers, academicians, and others involved in decision-making processes. Decision Science professionals are relevant in many fields such as manufacturing, marketing, banking, finance, logistics, healthcare, transportation, telecommunication, forestry, military, energy among others. The aim of this program is to produce graduates with the advanced knowledge, principles, and skills in term of theoretical and practical foundation for designing, implementing and managing information technology solutions and resources and also recognizing the impact of technology on individuals, organization, and society. The aim of this program is to produce graduates who possess international business related knowledge, analytical and professional skills and prepare them for the challenges of managing the organization in the current global business environment. The Master of Science (Management) was introduced to produce graduates who have deep knowledge about the management aspect of a business and capable of performing relevant tasks in today’s global business environment. The objective is to produce excellent and professional executives that are capable of translating the theory learned during classes into practice. Graduates of this program are also expected to become capable leaders that can identify and resolve issues and problems related to management and business, domestically or internationally.